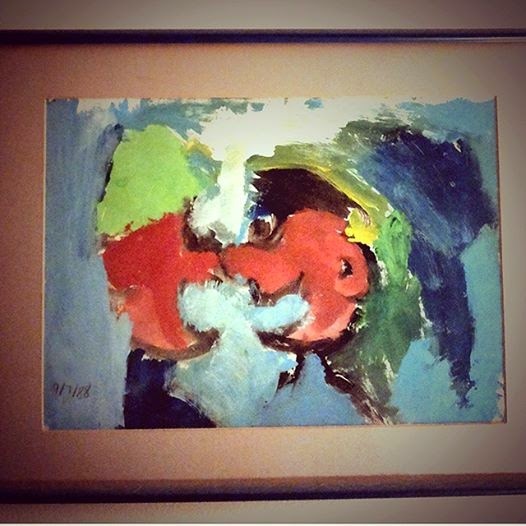 I remember painting this within minutes when I was eight years old. My dad was so impressed he immediately decided to get it framed. If you look closely you can see two cartoony people facing each other in close proximity. I used to call this "The Argument", but later thought it might be bad juju and renamed it "The Conversation". Today, if I'm to be honest, I acknowledge it should have been called what I'd always known intrinsically I wanted it to be called: "Two Men Moving In For A Kiss".